Rooster fish, ‘Pez Gallo’, are widely regarded as being one of the worlds great species of inshore gamefish. 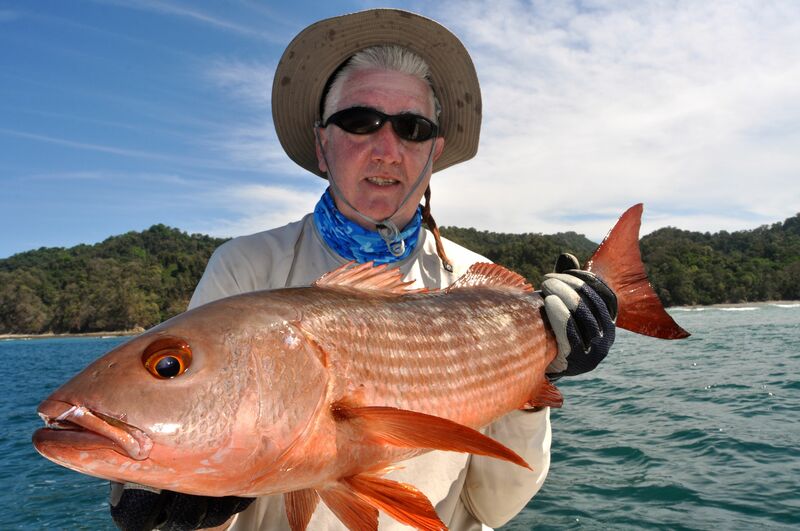 Distributed on the Pacific coast of central and South America between Mexico and northern Peru, Panama is widely regarded as being one of the very best places to hook up with one of these fast running, hard fighting and most beautiful species of fish. 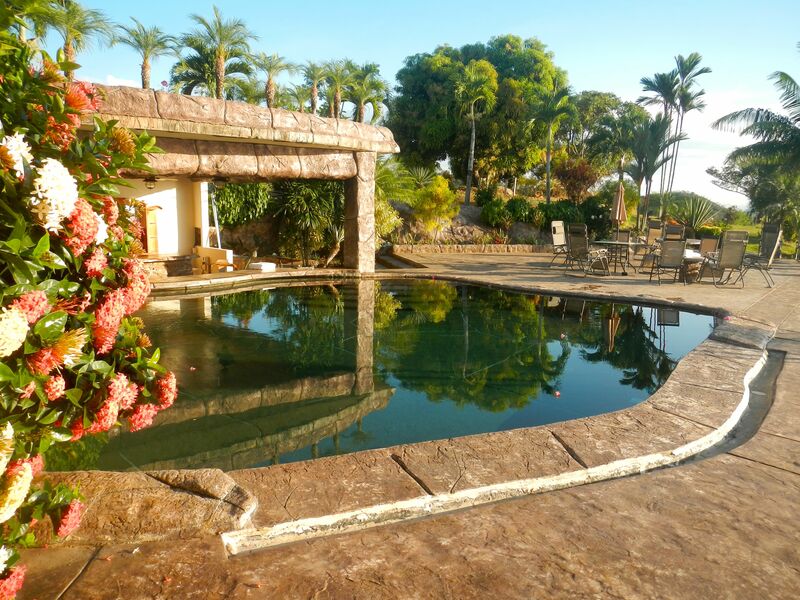 Paradise Fishing Lodge, located in Chiriqui District northern Panama, is just a short run from Coiba National Marine Park, which consists of Coiba, the largest island in Central America, and 37 surrounding islands. I had previously been told that if you want to catch rooster fish, lots of rooster fish, big rooster fish, then this is the area to fish. Now, having just spent a week fishing there, all I can say is that my intel was absolutely correct. One of several 30-40lb roosters caught during the trip. 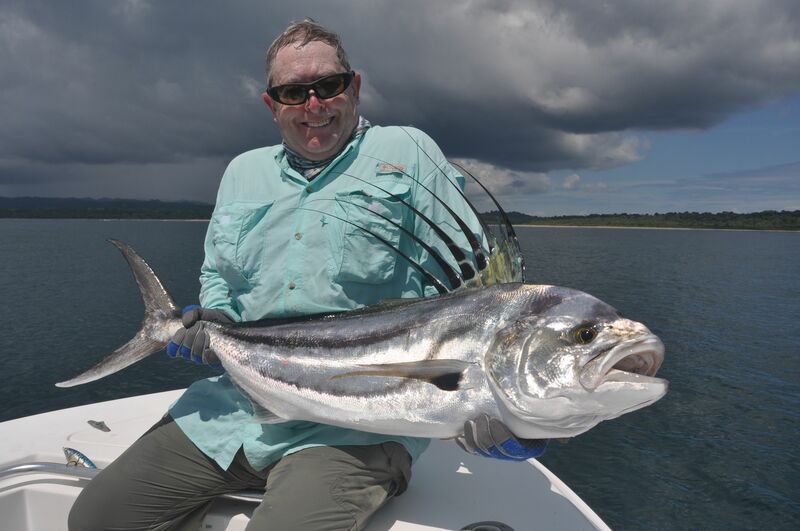 Prior to this trip I had caught a fair few roosters over the years during previous trips to Costa Rica and Panama, but never a really good one, say a fish over 40lb. Well, when we returned to the dock at the end of our first day I had personally boated, and released, 3 fine roosters for an aggregate weight of 100lb, individually estimated at weighing 20lb, 35lb and 45lb; I was delighted. Further, my two boat companions, Derek ‘Del’ Elliott and Ray Jennings had both boated there first roosters. ‘Del’ with the best fish of the trip, a 55lb+ rooster. Releasing a great rooster fish. 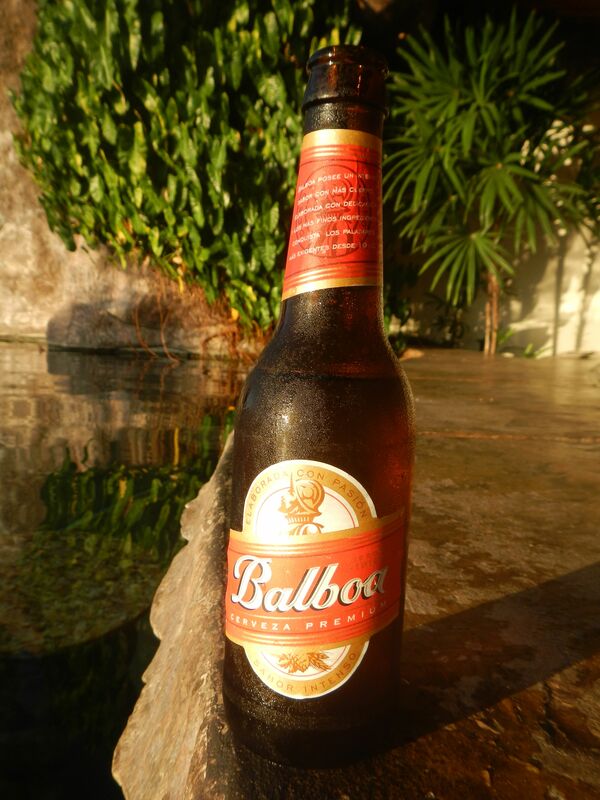 Relaxing at the lodges pool bar, snacking on tasty tuna bake appetisers while ‘rehydrating’ on ice cold bottles of Balboa, we soon learned that everyone of our group of 11 had enjoyed a great day, almost all having released at least one rooster. 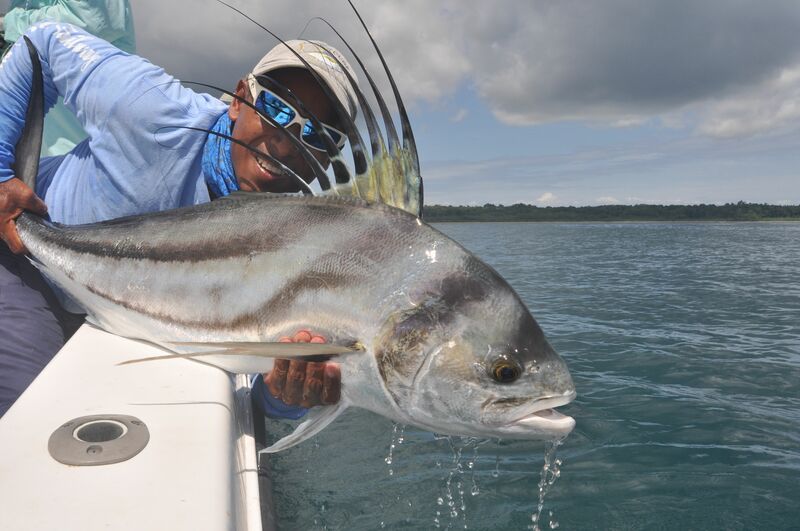 The two most popular techniques of catching rooster fish in these waters are either popping, or very slow trolling using livebaits, usually blue runners. I found my Shimano 20-30lb SpeedMaster STC 4-Piece, Talica 16 combo loaded with Power Pro was the perfect combination for live baiting using 7/0 Owner circle hooks. Also my new Shimano Wild Romance STC Pelagic Offshore 4-piece popping rod with Twin Power 10000, again loaded with Power Pro, was perfect for casting the small to medium size poppers and stick baits we mostly used. My best rooster of the trip, estimated at 40-45lb. 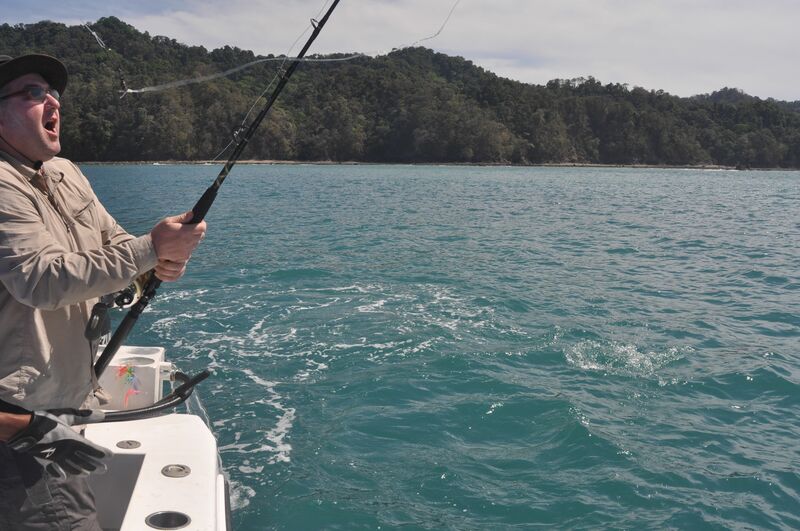 Of course it wasn’t just rooster fish we caught, these rich waters teem with a wide variety of different species. 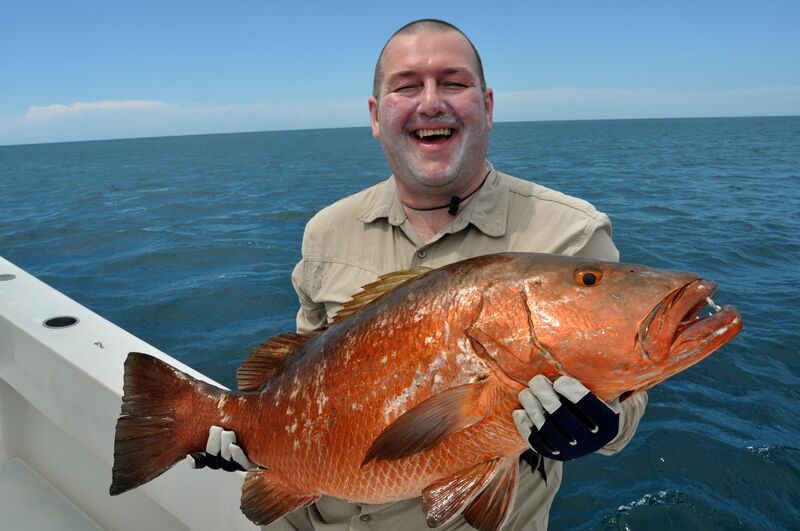 Over the course of our week a good number of cubera snapper to an estimated 60lb were caught, along with plenty of bluefin trevally, Pacific jack crevalle and horse eye jacks, again both on live baits and lures. Even more variety came by way of mullet snapper, African pompano, sierra mackerel, several species of shark, yellowfin tuna, amberjack, bonito and a few others. Black marlin and sailfish were caught offshore every day we fished. 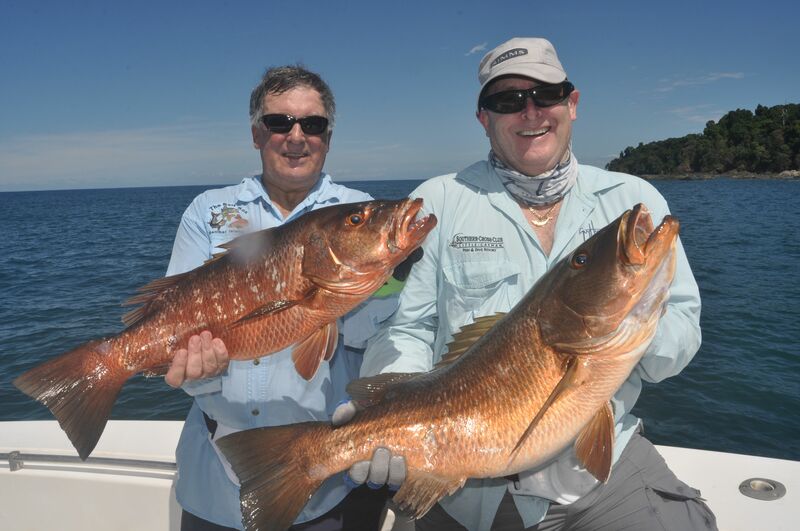 A brace of nice cubera snapper for Del & Ray. 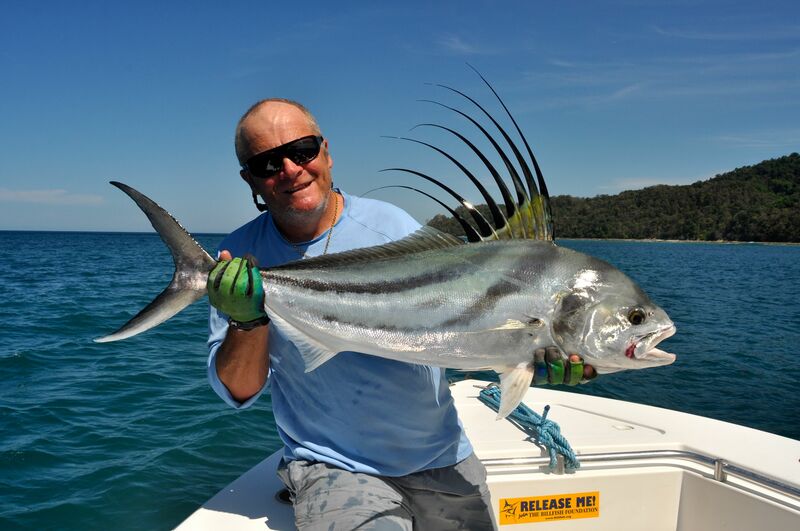 By the end of the week everyone had released rooster fish, with bragging rights for the best fish of the trip going to ‘Del’, with a stunning 55lb+ fish he boated using a stick bait. I was stood alongside him as this fine fish was hoisted aboard, and I think my right eardrum has just about recovered! 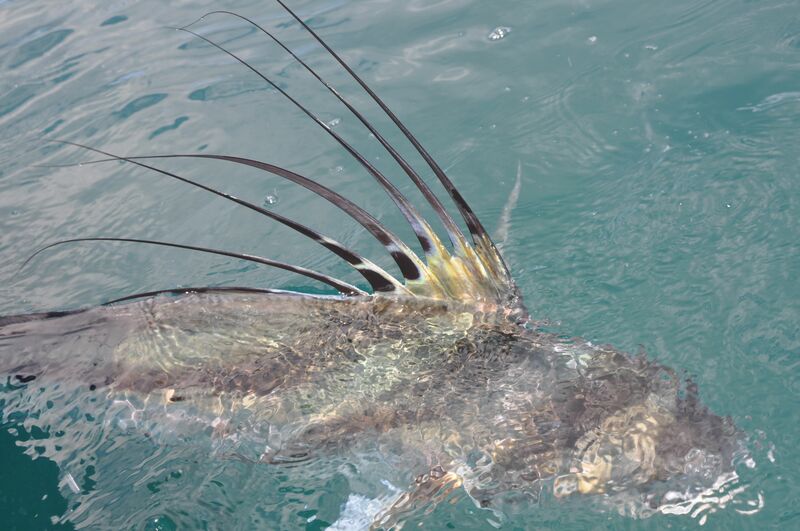 The following day I witnessed John Phillips hook and almost boat an even bigger rooster. This fish had taken a live 4lb bonito and John almost had it at the boat when it threw the hook. It was easily 60lb+, and I managed to catch the look of shock on John’s face at the exact moment to hook pulled! 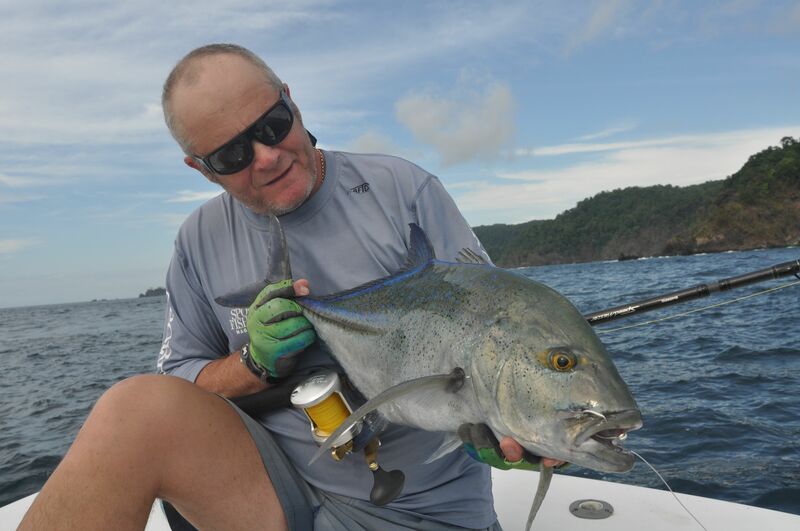 Luckily John went on the boat a 40lb cubera and a nice African pompano along with plenty of other fish. Nice mullet snapper for Simon Powell. 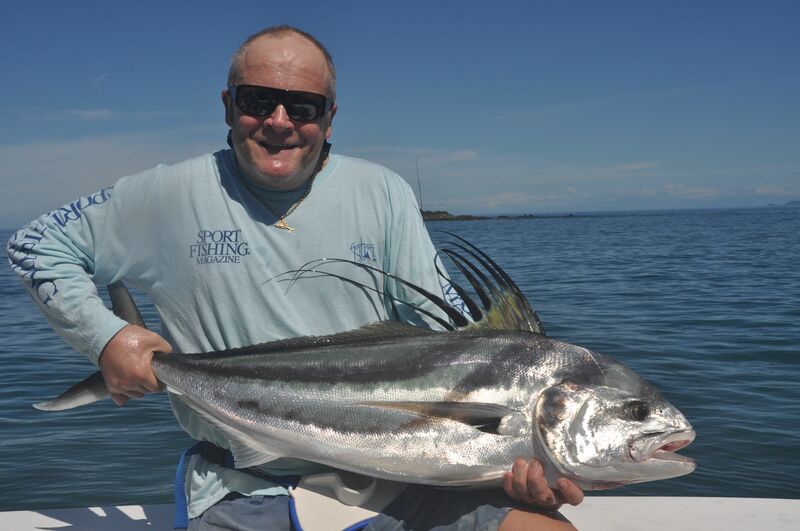 Ray fights a good rooster off Coiba Island. The moment John lost his monster rooster! 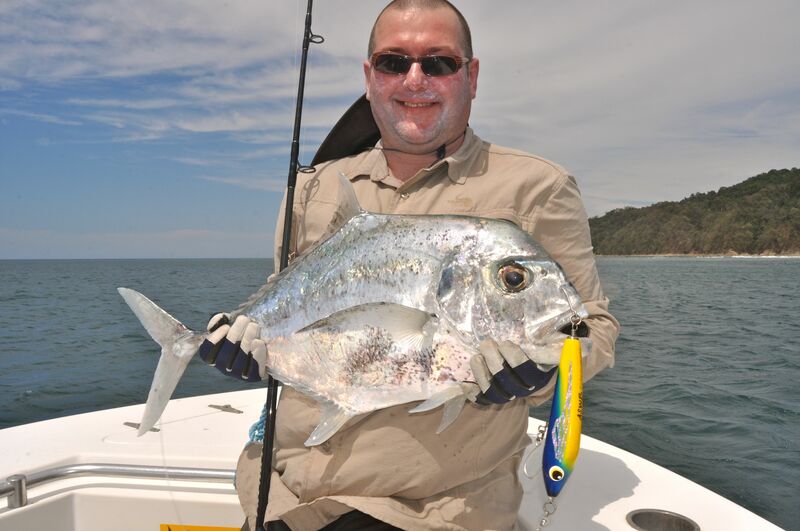 And a great African pompano caught on a stick bait. Originally we had planned a possible return visit to Panama for early 2017, but it wasn’t long into this trip before we started kicking around options for an earlier trip. 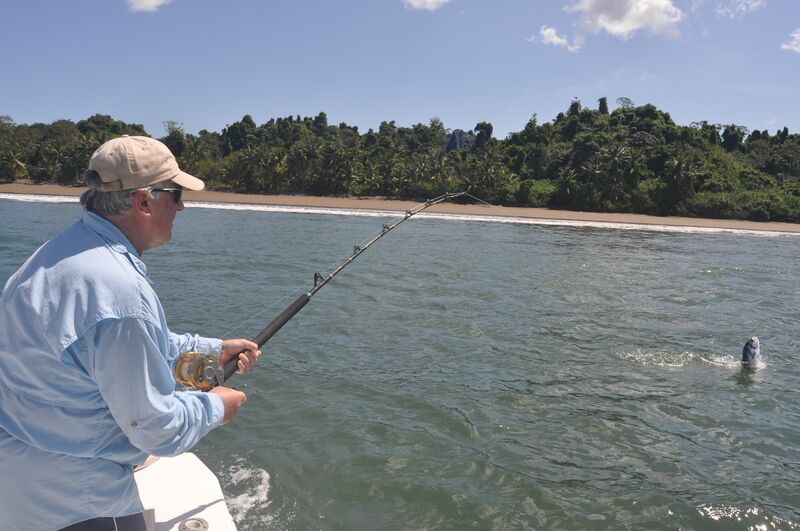 Consequently plans for trips booked to other destinations in the early part of 2016 have been put on hold, and we will be returning to Panama Fishing Lodge in February next year. As things stand it looks very much as if this trip, max 12 fishing three per boat, is full, but if you think you might like to join us or would like to book a private trip to this truly world class operation, I suggest you contact Anglers World Holidays on Tel: 01246 221717 ASAP. For more information on the lodge visit: http://paradisefishinglodge.com The last time I blogged I ended with a short review of the new Buff light weight fishing gloves, which are perfect for fly fishing and general protection from the sun. This trip I tried out the heavier duty version of these gloves, designed for regular casting with finger slicing braided lines. 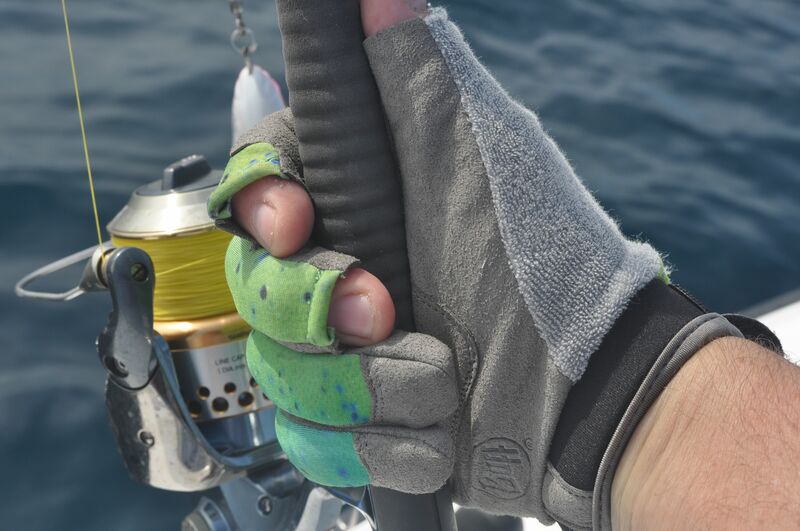 Finished in an eye catching dorado pattern, these gloves feature extra padding just where you need it for casting protection, while providing excellent grip and extremely useful patches of toweling that are perfect for wiping sweat and sun cream out of your eyes while fighting big fish. The new Buff heavy duty, SPF protecting, fishing gloves. Perfect for safely handling fish. 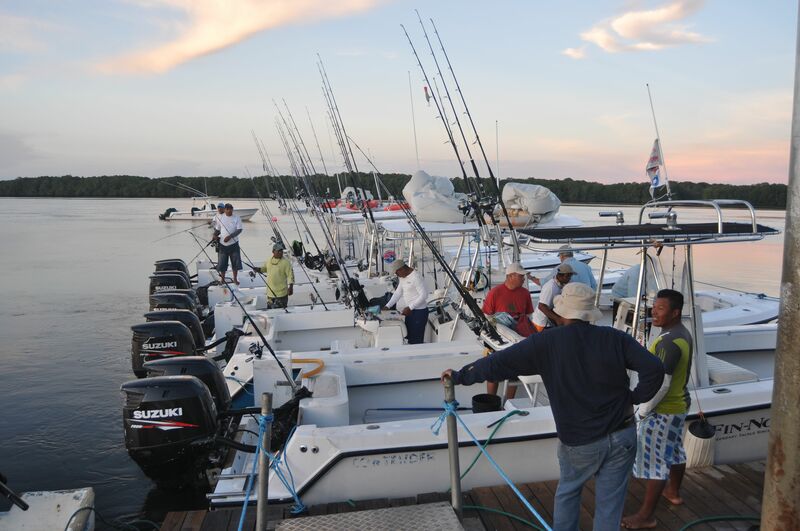 Fleet of large, fast, spacious & comfortable sport fishing boats based at Paradise Fishing Lodge. And don’t forget to maintain your fluid levels! Great trip Dave in such a wonderful place with great company. Role on the next trip. Next year is book, can’t wait! Looks like you put yourself and the boys on the fish yet again .Fantastic.Looking to go to Panama in April to pop for some tuna..Would you recommend a stellar 18000….If so what one?…Twin power 10000? spill the beans.